Persons seeking to use Live Advice 4 You for advice will register an account online opening up direct contact with live advisors in a wide variety of areas such as medical, counseling, spiritual, legal advice, tax preparation, accounting, home repair, proofreading, resume preparation, virtual administrative assistance and more. The user can choose from the best experts in the field and speak directly with the expert 1-on-1 via telephone to ask questions and receive answers and advice. Experts sign up as “advisors” who are paid by the users for their expertise in a cost-per-minute advisory call or by a specific project rate, providing an opportunity for professionals to sell their expertise by telephone to a broad international clientele. 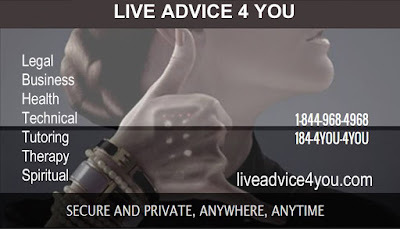 LiveAdvice4you.com provides an easy to use online control panel that makes it easy for clients to schedule and purchase telephone advice sessions in a completely secure and private environment. One big difference from its competitors is that Live Advice 4 You proudly offers the lowest fees available to advisors which enable expert advisors to offer much lower rates to customers who use this website to access their advice. New users who register for this service this month can receive free expert advice time once they have finished their account registration and added initial funds.